I thought it would be cute to show you a 2nd Valentine look that's causal for the office and perfect for a casual night out. When I found this top I thought it was so cute. It's actually pretty comfy. My son kept asking me what I had on my shirt, and I would reply hearts. He kept saying "No mommy, those are heart lollipops." I can't say that he's wrong. He's got a great eye and I thanked him for the correction. Possible fashionisto? I think yes! I've been loving the flare jeans. They are super comfortable and so flattering. The hubby doesn't tend to agree with this trend, he's not a fan of these jeans. I'd love to know what you plan on wearing this Valentine's Day. I'm sticking to casual looks for work and play, but I think it screams "Love is in the air!" 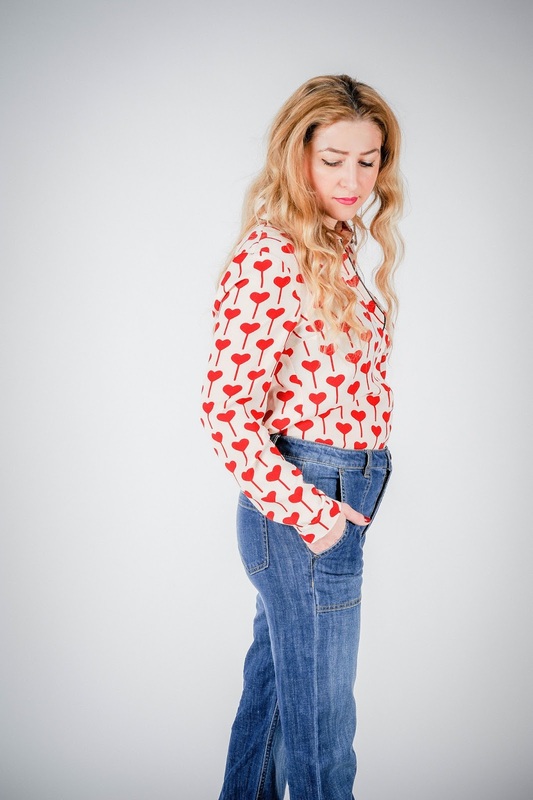 I'm loving that blouse, perfect for valentines!! What a fun top! Perfect for teh holiday! What a cute shirt, love it! Loving this top! Your pic totally caught my eye in the linkup. Heart Lollipops! Adorable. I love what kids say. That shirt is really cute! Thanks for joining our Tuesday Fashion Link Up Party! 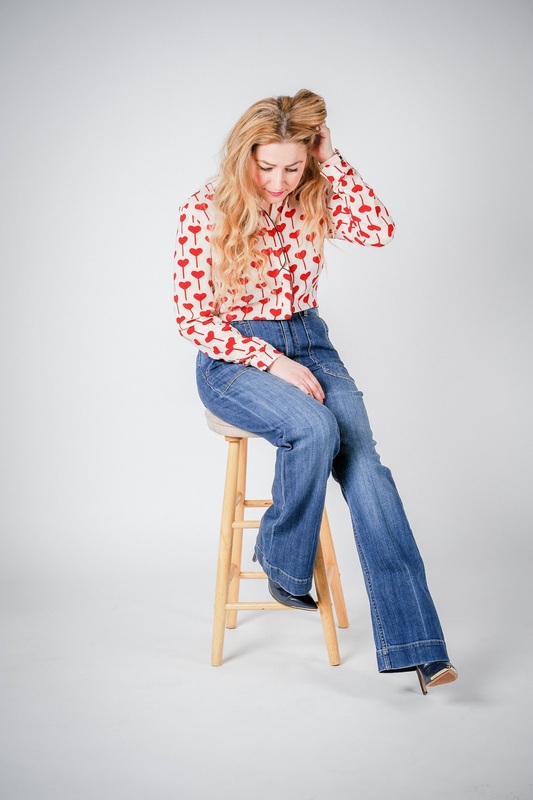 I love that shirt...so adorable, and those high waisted jeans suit you so well!! I love the jeans! The blouse is pretty cute, too! That top is absolutely adorable! It is perfect for Valentine's Day! Thanks for linking up with me and this will be getting pinned to the linkup board! That is such a cute top. I have no idea what I'm wearing for Valentine's Day yet. Love the look Crissy!! So you. 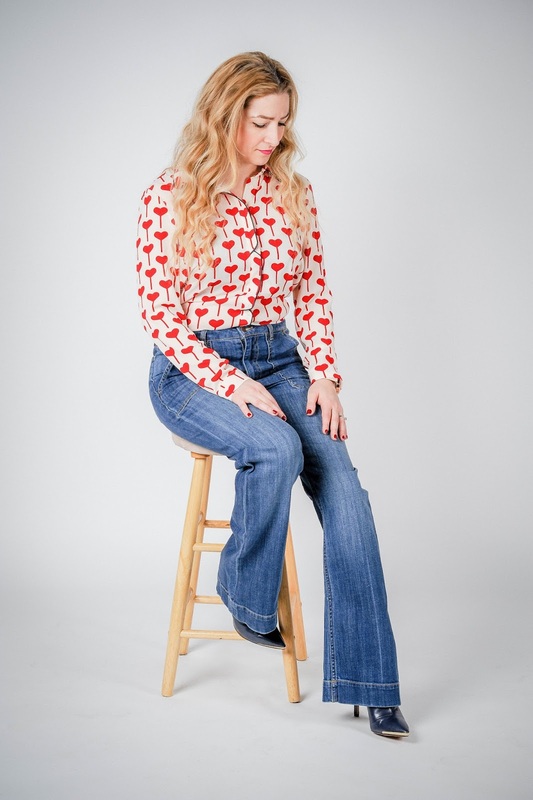 The flared jeans look amazing on you! Very cool shirt and perfect for Valentine's Day! I like how you casually styled it with jeans. Thanks for linking up to Top of the World Style. The title of your post reminded me of a song that I loved as a kid "My boy lollipop." The pattern is daring, but works. Adorable pattern on your top. Perfect for Valentines Day. Thanks for joining us at My Refined Style. The perfect cool girl V Day outfit! Thanks so much for being a part of Fun Fashion Friday! Such a cute festive top! Perfect for Valentine's Day weekend! You really captured the Valentine's mood with this look! Thanks for sharing your style flair on the My Refined Style Linkup. See you next month! This is so cute!! I'm a sucker for heart shirts like this! I'll probably be in workout pants because I plan to do some hiking on Valentine's day! I have a cute rose pair that might work perfectly for the holiday. Thanks for sharing your outfit and linking up with us!